One of the best parts of taking the Sommelier course back in 1999-2000 in Halifax, then teaching it later on here in New Brunswick, was the opportunity to taste the iconic wines of the world: Grand Cru Burgundies, Classed Growth Bordeaux, top Barolos, Prestige Champagne, Super Tuscans, and other wines I would generally never get to drink because they were far out of my price range. Tasting them with others who were learning about fine wine was an excellent way to experience these premium wines for the first time. To be truthful, in 1999 I didn’t really know what I was tasting, as I was a relative newbie. Looking back now, I have had the benefit of over a dozen years tasting and writing, traveling the wine world, judging, and doing events, and I have tasted many of these wines several times, sometimes at the actual wineries, and I feel confident that I know where they sit in the wine world. I can separate their reputation from their actual quality, and give some perspective on their price and status. 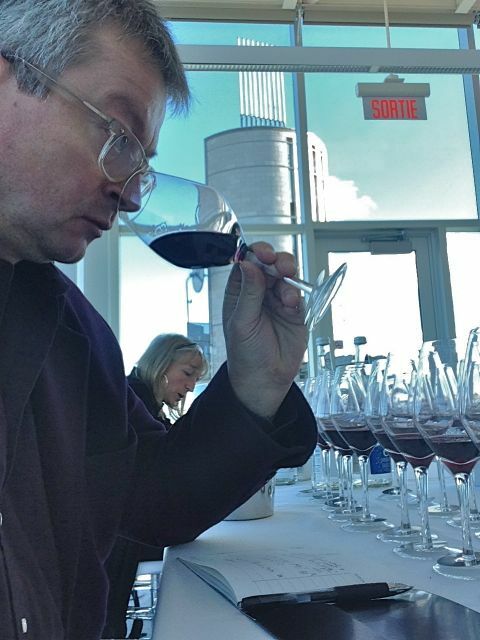 This was put to the test a few weeks ago when I had the honour of being invited to be one of only a handful of Canadians to participate in the Master Blending Classification in Montreal, where we blind tasted 30 of the top Cabernet Sauvignon blends in the world, all from the 2009 vintage. 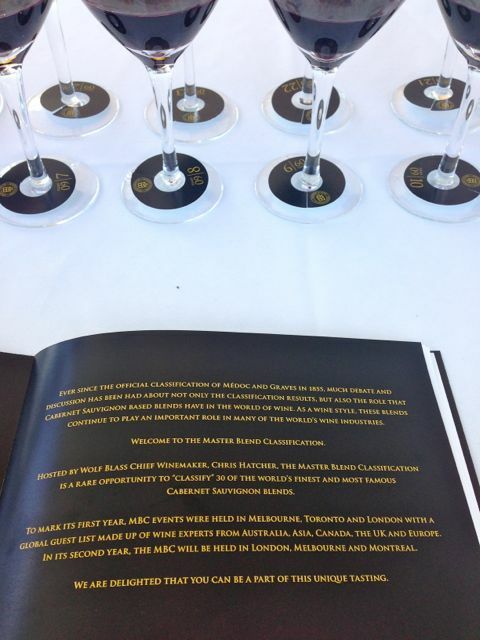 This annual event is organized by Wolf Blass, with the intent to show where their top red – their Black Label Cabernet Shiraz – sits in the upper echelons of the world’s best Cabs. And these WERE the best, at least the ones generally considered to be so, based on magazines and the price tags. Many top Bordeaux were there, including all five First Growths; these are the top Cabernet Sauvignon-heavy blends of the Left Bank of Bordeaux, that were ranked in the famous 1855 classification. Chateau Mouton Rothschild, Lafite Rothschild, Haut Brion, Margaux and Latour are collectively the Rolls Royce of wine. 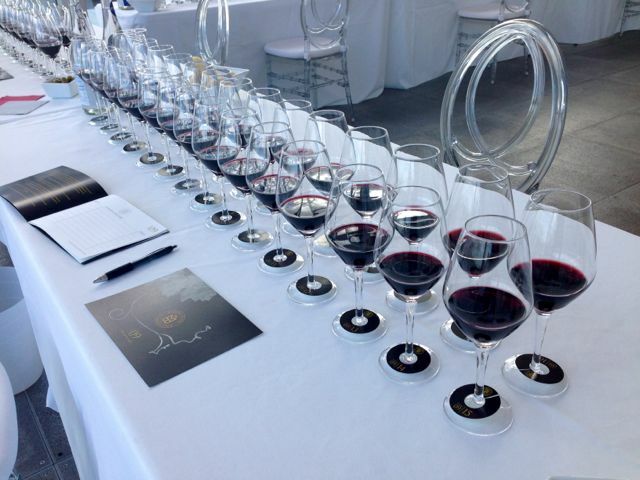 The 2009’s we tasted sell on the world market right now for well over $1000 a bottle; for example a case of 12 bottles of 2009 Lafite goes for over $18,000, according to Decanter magazine. Other iconic reds at the tasting were Italy’s top Super Tuscans: Sassicaia, Solaia, and Ornellaia. Top Napa efforts were there too, including Opus One, Dominus, Joseph Phelps Insignia, Harlan Proprietary, and Ridge Monte Bello. Similarly, the best of South Africa, Chile, and Australia were representing their countries. This was, indeed, the tasting of a lifetime for me, as least thus far in my wine life, and the immense task was not lost on me. I treated it as a major lesson, and also a great opportunity to contribute to a very interesting comparative exercise, while tasting some of the most amazing beverages the world can produce. We wine geeks love this stuff. I guess I have expensive tastes, since 3 of my top 6 scoring wines were First Growths, but I noticed that many judges didn’t score some of them very high. We see the scores, but not who gave them, so unless each taster tells the others their scores, we don’t find out who liked what. I scored them 93, 93, 92, 90 and 89, but I noticed some scores in the low 80’s and even in the 70’s. I know judges can be calibrated differently, but can you imagine a professional scoring a wine that cost over $1000 under 80/100? I doubt they will ever admit to it in print. My highest scoring wine was Chateau Pichon Longueville Comtesse de Lalande, a so-called “Super Second” growth, which typically sells for under $300 (what a deal!) whereas the top wine overall, on average, was another Bordeaux, Chateau Ducru Beaucaillou, another Super Second that I gave 91, available for $480 at Quebec’s SAQ. Clearly I prefer premium Bordeaux to top New World Cabernet, as I scored 11 wines 91 or above, 7 of which were Bordeaux. Yes, the wines on average scored very high, but note that we knew that all the wines were $100+ on the market. I can’t speak for other judges, but I expected all the wines to score over 90, and, when I was disappointed by a wine, I found it difficult to go below 90. That said, I had to, because that reflected how much I preferred other wines. Overall, my scores ranged from 88-94. Now, some of these wines sell for around $100, some are several hundred, and a few go up into the stratosphere, but – I’ll be frank – none of them justify a price tag over $150. Yes, they may do better, slightly, in a blind tasting when compared to the best Cabernets in the $25-50 range, but are they THAT much better? In my opinion, no. This actually makes the Wolf Blass Black Label look relatively good value, as it costs just under $100 at the ANBL, and scored an average of 90 at the event, which was also my score. I also scored Chile’s Vina Almaviva 93, and it sells for under $150 in Quebec. The truth is that demand, particularly from Asia, has pushed the price of the most famous wines to stupid price levels. I promise you – they are not worth it. This tasting was exciting, very informative, and I’d love to do it again, but I may never, so that may have been the tasting of my lifetime. Sadly, I had to spit, but don’t worry, I did drink a little bit of all my top scorers after they revealed the wines – I’m not an idiot!